Chanteur Country US né Harold J. Breau, le 5 Juin 1916 à Pea Cove (Maine). Lone Pine fut le mari de Betty Cody. Il est décédé le 26 Mars 1977. Hal Lone Pine (born Harold J. Breau in Pea Cove, Maine) and his wife Betty Cody are best-known these days as the parents of guitar phenom Lenny Breau, but in their day they were bona-fide country music stars themselves. 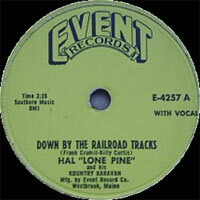 Hal's career in country music began during the 1940's, when he toured New England and the Canadian maritime provinces billed as "The Lone Pine Mountaineer & The Noisiest Gang in Radio." 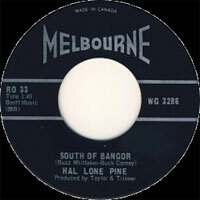 After changing his stage name to Hal Lone Pine, he met and married Betty, who was an accomplished yodeler, and moved his family to Winnipeg, where he hosted his own radio show and a TV series, The Lonepine Caravan. After his marriage with Betty fell apart, Hal moved back to the east coast, where he toured with Lenny and hosted radio shows on CFBC in Saint John, New Brunswick and WABI in Bangor, Maine. 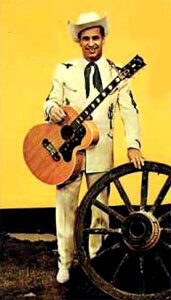 Eventually, Hal settled for good in Wheeling, West Virginia, where he was a featured attraction on the WWVA Wheeling Jamboree until he passed away in 1977. The following year he was posthumously inducted into the Maine Country Music Hall of Fame. 1950 78 t. & SP BLUEBIRD 55-3256 / 57-5023 (CAN) . 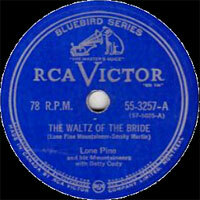 02/1950 78 t. RCA VICTOR 21-0179 (CAN) . 1951 78 t. & SP BLUEBIRD 55-3266 / 57-5052 (CAN) . 01/1952 SP RCA VICTOR 47-4482 (US) . 03/1952 SP RCA VICTOR 47-4581 (US) . 1952 78 t. & SP BLUEBIRD 55-3271 / 57-5059 (CAN) . 05/1952 SP RCA VICTOR 47-4720 (US) . 08/1952 SP RCA VICTOR 47-4879 (US) . 11/1952 SP RCA VICTOR 47-5044 (US) . 02/1953 SP RCA VICTOR 47-5156 (US) . 05/1953 SP RCA VICTOR 47-5263 (US) . 10/1953 SP RCA VICTOR 47-5468 (US) . 01/1954 SP RCA VICTOR 47-5556 (US) . 02/1954 SP RCA VICTOR 47-5625 (US) . 05/1954 SP RCA VICTOR 47-5700 (US) . 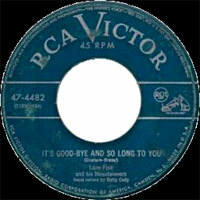 07/1954 78 t. RCA VICTOR 20-5796 (US) . 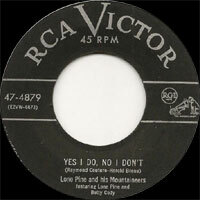 10/1954 78 t. RCA VICTOR 20-5869 (US) . 12/1954 SP RCA VICTOR 47-5968 (US) . 12/1954 78 t. RCA VICTOR 20-5991 (US) . 03/1955 SP RCA VICTOR 47-6049 (US) .